"Single father" redirects here. For other uses, see Single Father (disambiguation). "Single mother" redirects here. For the Canadian rock band, see Single Mothers (band). "Single Parents" redirects here. For the ABC television series, see Single Parents (TV series). 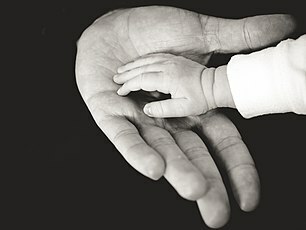 A single parent is a person who lives with a child or children and who does not have a wife, husband or live-in partner. A single parent may have either sole custody of the child or joint physical custody, where the child lives part-time with each parent. Reasons for becoming a single parent include divorce, break-up, abandonment, death of the other parent, childbirth by a single woman or single-person adoption. A single parent family is a family with children that is headed by a single parent. Single parenthood has been common historically due to parental mortality rate due to disease, wars and maternal mortality. Historical estimates indicate that in French, English, or Spanish villages in the 17th and 18th centuries at least one-third of children lost one of their parents during childhood; in 19th-century Milan, about half of all children lost at least one parent by age 20; in 19th-century China, almost one-third of boys had lost one parent or both by the age of 15. Such single parenthood was often short in duration, since remarriage rates were high. Divorce was generally rare historically (although this depends by culture and era), and divorce especially became very difficult to obtain after the fall of the Roman Empire, in Medieval Europe, due to strong involvement of ecclesiastical courts in family life (though annulment and other forms of separation were more common). Among all households in OECD countries in 2011, the proportion of single-parent households was in 3-11% the range, with an average of 7.5%. It was highest in Australia (10%), Canada (10%), Mexico (10%), United States (10%), Lithuania (10%), Costa Rica (11%), Latvia (11%) and New Zealand (11%), while it was lowest in Japan (3%), Greece (4%), Switzerland (4%), Bulgaria (5), Croatia (5%), Germany (5%), Italy (5%) and Cyprus (5%). The proportion was 9% in both Ireland and the United Kingdom. In all OECD countries, most single-parent households were headed by a mother. The proportion headed by a father varied between 9% and 25%. It was lowest in Estonia (9%), Costa Rica (10%), Cyprus (10%), Japan (10%), Ireland (10%) and the United Kingdom (12%), while it was highest in Norway (22%), Spain (23%), Sweden (24%), Romania (25%) and the United States (25%). These numbers were not provided for Canada, Australia or New Zealand. In 2016/17, the proportion of children living in a single-parent household varied between 6% and 28% in the different OECD countries, with an OECD country average of 17%. It was lowest in Turkey (2015, 6%), Greece (8%), Croatia (8%) and Poland (10%), while it was highest in France (23%), United Kingdom (23%), Belgium (25%), Lithuania (25%), United States (27%) and Latvia (28%). It was 19% in Ireland and Canada. Among children living in a single-parent household, most live primarily with their mother, others primarily with their father, while other children have a shared parenting arrangement where they spend an approximately equal amount of time with their two parents. Among those living primarily with one single parent, most live with their mother. In 2016 (or latest year available), the proportion of 6-12 year olds living primarily with their single father ranged between 5% and 36% among the different OECD countries. It was highest in Belgium (17%), Iceland (19%), Slovenia (20%), France (22%), Norway (23%) and Sweden (36%), while it was lowest in Lithuania (4%), Ireland (5%), Poland (5%), Estonia (7%), Austria (7%) and the United Kingdom (8%). It was 15% in the United States. In 2005/06, the proportion of 11-15 year old children living in a shared parenting arrangement versus with only one of their parents varied between 1% and 17%, being the highest in Sweden. It was 5% in Ireland and the United States, and 7% in Canada and the United Kingdom. By 2016/17, the percentage in Sweden had increased to 28%. It has been statistically proven that the lack of social support for single mothers causes them to spiral into depression. Over 9.5 million American families are run by one woman. Single mothers are likely to have mental health issues, financial hardships, live in a low income area, and receive low levels of social support. All of these factors are taken into consideration when evaluating the mental health of single mothers. The occurrence of moderate to severe mental disability was more pronounced among single mothers at 28.7% compared to partnered mothers at 15.7%. These mental disabilities include but are not limited to anxiety and depression. Financial hardships also affect the mental health of single mothers. Women, ages 15–24, were more likely to live in a low socio-economic area, have one child, and not to have completed their senior year of high school. These women reported to be in the two lowest income areas, and their mental health was much poorer than those in higher income areas. A similar study on the mental health of single mothers attempted to answer the question, "Are there differences in the prevalence of psychiatric disorders, between married, never-married, and separated/divorced mothers?" Statistically, never married, and separated/divorced mothers had the highest regularities of drug abuse, personality disorder and PTSD. The family structure can become a trigger for mental health issues in single mothers. They are especially at risk for having higher levels of depressive symptoms. Studies from the 1970s showed that single mothers who are not financially stable are more likely to experience depression. In a more current study it was proven that financial strain was directly correlated with sky rocket levels of depression. Among low-income, single mothers, depressive symptoms may be as high as 60%. Inadequate access to mental health care services is prevalent amongst impoverished women. Low-income women are less likely to receive mental health care for numerous reasons. Mental health services remain inequitable for low-income, more so, low-income single women are more likely to suffer from depression, anxiety, and other poor mental health outcomes. Researchers Copeland and Snyder (2011) addressed the barriers low-income single mothers have on receiving mental health care, "Visible barriers often include the lack of community resources, transportation, child care, convenient hours, and financial resources." Meanwhile, low-income single mothers are more likely to bring their children in for mental health treatment than themselves. Researchers Copeland and Snyder analyzed sixty-four African American mothers who brought their children in for mental health treatment. These mothers were than screened for mild, moderate, and severe depression and/or anxiety. After three months the researchers used an ethnographic interview to address whether or not the participants used mental health services that were referred to them. Results indicated that the majority of the participants did not use the referred mental health care services for reasons that included: fear of losing their children, being hospitalized and/or stigmatized by their community counterparts. Single father is a man raising a child or children alone on his own. Usually harder for a single dad because he is not expected to take over the ever growing role of being a single dad. According to David Blankenhorn, Patrick Fagan, Mitch Pearlstein David Popenoe and Barbara Dafoe Whitehead, living in a single parent family is strongly correlated with school failure and problems of delinquency, drug use, teenage pregnancies, poverty, and welfare dependency in the United States. Using multilevel modeling, Suet-Ling Pong has shown that a high proportion of American children from single parent families perform poorly on mathematics and reading achievement tests. In Sweden, Emma Fransson et al. have shown that children living with one single parent have worse well-being in terms of physical health behavior, mental health, peer friendships, bullying, cultural activities, sports, and family relationships, compared to children from intact families. As a contrast, children in a shared parenting arrangement that live approximately equal amount of time with their divorced mother and father have about the same well-being as children from intact families and better outcomes than children with only one custodial parent. The United Kingdom Office for National Statistics has reported that children of single parents, after controlling for other variables like family income, are more likely to have problems, including being twice as likely to suffer from mental illness. Both British and American researchers show that children with no fathers are three times more likely to be unhappy, and are also more likely to engage in anti-social behavior, abuse substance and engage in juvenile deliquency. There is some debate among experts as to what the important component of the family structure is, particularly in the US, centering on whether or not a complete family or the love and affection of the children's parents is more important. There are even some that argue that a single parent family is not even really a family. In American society, where living standard is very high, single moms and single dads are more likely to be poor, not only because they don't have help in the household, but also because they didn't have much money to begin with. With respect to this, recent public policy debates have centered on whether or not government should give aid to single parent households, which some believe will reduce poverty and improve their situation, or instead focus on wider issues like protecting employment. In addition, there is a debate on the behavioral effects of children with incarcerated parents, and how losing one or both parents to incarceration affects their academic performance and social well-being with others. It is encouraged that each parent respect the other, at least in the child's presence[by whom? ], and provide child support for the primary caregiver, when parents are not married or separated. The civil behavior among separated parents has a direct effect on how child copes with their situation; this is especially seen in younger children who do not yet understand their familial separation, requiring both parents to establish a limited friendship to support the upbringing of their child. 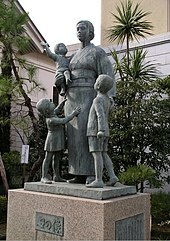 Statue of a mother at the Yasukuni Shrine, dedicated to war widows who raised their children alone. Historically, death of a partner was a common cause of single parenting. Diseases and maternal death not infrequently resulted in a widower or widow responsible for children. At certain times wars might also deprive significant numbers of families of a parent. Improvements in sanitation and maternal care have decreased mortality for those of reproductive age, making death a less common cause of single parenting. Child custody in reference to divorce refers to which parent is allowed to make important decisions about the children involved. Physical custody refers to which parent the child lives with. Among divorced parents, "parallel parenting" refers to parenting after divorce in which each parent does so independently; this is most common. In comparison, cooperative parenting occurs when the parents involved in the child's life work together around all involved parties' schedules and activities, and this is far less common. After a certain "crisis period," most children resume normal development; however, their future relationships are often affected, as they lack a model upon which to base a healthy long term relationship. Nonetheless, as adults children of divorcees cope better with change. Children are affected by divorce in many different ways, varying by the circumstances and age of the child. Young children ages two to six are generally the most fearful of parental separation, and often feel abandoned or confused. Both boys and girls have the same amount of trouble coping, but often show this in different ways. Nonetheless this age group adapts best to their situations, as they are often too young to remember their non-custodial parent vividly. Children ages seven to twelve are much better at expressing emotions and accepting parentage breakage, but often distrust their parents, rely on outside help and support for encouragement, and may manifest social and academic problems. Adolescents cope the worst with divorce; they often struggle most with the change, and may even turn away from their family entirely, dealing with their situation on their own. They often have problems expressing feelings, similar to far younger children, and may have adjustment issues with long-term relationships due to these feelings. Keeping in touch with both parents and having a healthy relationship with both mother and father appears to have the most effect on a child's behavior; which leads to an easier time coping with the divorce as well as development through the child's life. Children will do better with their parents divorce if they have a smooth adjustment period. One way to make this adjustment easier on children is to let them "remain in the same neighborhoods and schools following divorce." Some out-of-wedlock births are intended, but many are unintentional. Out-of-wedlock births are not acceptable to society, and they often result in single parenting. A partner may also leave as he or she may want to shirk responsibility of bringing up the child. This also may harm the child. Where they are not acceptable, they sometimes result in forced marriage, however such marriages fail more often than others. Mothers with unintended pregnancies, and their children, are subject to numerous adverse health effects, including increased risk of violence and death, and the children are less likely to succeed in school and are more likely to live in poverty and be involved in crime. "Fragile Families" are usually caused by an unintended pregnancy out of wedlock. Usually in this situation the father is not completely in the picture and the relationship between the mother, father, and child is consistently unstable. As well as instability "fragile families" are often limited in resources such as human capital and financial resources, the kids that come from these families are more likely to be hindered within school and don't succeed as well as kids who have strictly single parents or two parent homes. Usually within these families the father plans to stick around and help raise the child but once the child is born the fathers do not stay for much longer and only one third stay after five years of the child's birth. Most of these fragile families come from low economic status to begin with and the cycle appears to continue; once the child grows up they are just as likely to still be poor and live in poverty as well. Most fragile families end with the mother becoming a single parent, leaving it even more difficult to come out of the poverty cycle. The gender of the baby seems to have no effect if the father is not living with the mother at the time of the birth meaning they are still likely to leave after one year of the child's birth. Yet there is some evidence that suggests that if the father is living with the mother at the time of the birth he is more likely to stay after one year if the child is a son rather than a daughter. Some individuals choose to become pregnant and parent on their own. Others choose to adopt. Typically referred to in the West as "Single Mothers by Choice" or "Choice Moms" though, fathers also (less commonly) may choose to become single parents through adoption or surrogacy. Many turn to single parenthood by choice after not finding the right person to raise children with, and for women, it often comes out of a desire to have biological children before it is too late to do so. 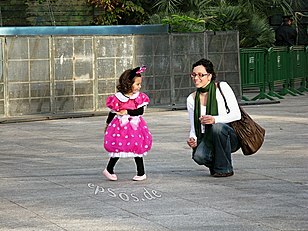 Single parent adoptions have existed since the mid 19th century. Men were rarely considered as adoptive parents, and were considered far less desired. Often, children adopted by a single person were raised in pairs rather than alone, and many adoptions by lesbians and gay men were arranged as single parent adoptions. During the mid 19th century many state welfare officials made it difficult if not impossible for single persons to adopt, as agencies searched for "normal" families with married men and women. In 1965, the Los Angeles Bureau of Adoptions sought single African-Americans for African-American orphans for whom married families could not be found. In 1968, the Child Welfare League of America stated that married couples were preferred, but there were "exceptional circumstances" where single parent adoptions were permissible. Single parent adoptions are controversial. They are, however, still preferred over divorcees, as divorced parents are considered an unnecessary stress on the child. In one study, the interviewers asked children questions about their new lifestyle in a single-parent home. The interviewer found that when asked about fears, a high proportion of children feared illness or injury to the parent. When asked about happiness, half of the children talked about outings with their single adoptive parent. A single person wanting to adopt a child has to be mindful of the challenges they may face, and there are certain agencies that will not work with single adoptive parents at all. Single parents will typically only have their own income to live off of, and thus might not have a backup plan for potential children in case something happens to them. Traveling is also made more complex, as the child must either be left in someone else's care, or taken along. In 2003, 14% of all Australian households were single-parent families. In Australia 2011, out of all families 15.9% were single parent families. Out of these families 17.6% of the single parents were males, whilst 82.4% were females. Single people are eligible to apply for adoption in all states of Australia, except for Queensland and South Australia. They are able to apply for adoption both to Australian born and international born children, although not many other countries allow single parent adoptions. Single parents in Australia are eligible for support payments from the government, but only if they are caring for at least one child under the age of eight. At the 2013 census, 17.8% of New Zealand families were single-parent, of which five-sixths were headed by a female. Single-parent families in New Zealand have fewer children than two-parent families; 56% of single-parent families have only one child and 29% have two children, compared to 38% and 40% respectively for two-parent families. In the United Kingdom, about 1 out of 4 families with dependent children are single-parent families, 8 to 11 percent of which have a male single-parent. UK poverty figures show that 52% of single parent families are below the Government-defined poverty line (after housing costs). Single parents in the UK are almost twice as likely to be in low-paid jobs as other workers (39% of working single parents compared with 21% of working people nationally). This is highlighted in a report published by Gingerbread, funded by Trust for London and Barrow Cadbury Trust. In the United States, since the 1960s, there has been a marked increase in the number of children living with a single parent. The jump was caused by an increase in births to unmarried women and by the increasing prevalence of divorces among couples. In 2010, 40.7% of births in the US were to unmarried women. In 2000, 11% of children were living with parents who had never been married, 15.6% of children lived with a divorced parent, and 1.2% lived with a parent who was widowed. The results of the 2010 United States Census showed that 27% of children live with one parent, consistent with the emerging trend noted in 2000. The most recent data of December 2011 shows approximately 13.7 million single parents in the U.S. Mississippi leads the nation with the highest percent of births to unmarried mothers with 54% in 2014, followed by Louisiana, New Mexico, Florida and South Carolina. In 2006, 12.9 million families in the US were headed by a single parent, 80% of which were headed by a female. The newest census bureau reports that between 1960 and 2016, the percentage of children living in families with two parents decreased from 88 to 69. Of those 50.7 million children living in families with two parents, 47.7 million live with two married parents and 3.0 million live with two unmarried parents. The percentage of children living with single parents increased substantially in the United States during the second half of the 20th century. According to Child Trends 2013, only 9% of children lived with single parents in the 1960s—a figure that increased to 28% in 2012. The main cause of single parent families are high rates of divorce and non-marital childbearing. In the United States, 83% of single parents are mothers. Among this percentage of single mothers: 45% of single mothers are currently divorced or separated, 1.7% are widowed, 34% of single mothers never have been married. Although decades ago, having a child outside of marriage and/or being a single mother was not prominent. Census information from 1960 tells us that in that year, only nine percent of children lived in single parent families. Today four out of every ten children are born to an unwed mother. The prevalence of single mothers as primary caregiver is a part of traditional parenting trends between mothers and fathers. Data supports these claims, showing that in comparison to men, women are doing more than two-thirds of all child caring and in some cases one hundred percent. Of approximately 12 million single-parent homes in 2015, more than 80 percent were headed by single mothers. This disproportionate statistic has been well- documented in multiple country contexts all around the world. The United States Census Bureau found that today, one in four children under the age of 18, a total of 17.4 million are being raised without a father at all. Women all around the world have been perpetually socialized to adhere to traditional gender roles that place the majority of responsibility for childcare upon them. Cultural definition of a mother's role contributes to the preference of mother as primary caregiver. The "motherhood mandate" describes the societal expectations that good mothers should be available to their children as much as possible. In addition to their traditional protective and nurturing role, single mothers may have to play the role of family provider as well; since men are the breadwinners of the traditional family, in the absence of the child support or social benefits the mother must fulfill this role whilst also providing adequate parentage. Because of this dual role, in the United States, 80% of single mothers are employed, of which 50% are full-time workers and 30% are part-time. Many employed single mothers rely on childcare facilities to care for their children while they are away at work. Linked to the rising prevalence of single parenting is the increasing quality of health care, and there have been findings of positive developmental effects with modern childcare. It is not uncommon that the mother will become actively involved with the childcare program as to compensate for leaving her children under the care of others. Working single mothers may also rely on the help from fictive kin, who provide for the children while the mother is at her job. All of these factors contribute to a well-documented heightened likelihood for single-parent, female-headed households to experience poverty. Single mothers are one of the poorest populations, many of them vulnerable to homelessness. In the United States, nearly half (45%) of single mothers and their children live below the poverty line, also referred to as the poverty threshold. They lack the financial resources to support their children when the birth father is unresponsive. Many seek assistance through living with another adult, perhaps a relative, fictive kin, or significant other, and divorced mothers who remarry have fewer financial struggles than unmarried single mothers, who cannot work for longer periods of time without shirking their child-caring responsibilities. Unmarried mothers are thus more likely to cohabit with another adult. Many of the jobs worked by, or are available to women, are not sufficient and do not bring in enough income for the mother and her children; this is common in the United States and other countries all over the world. In the United States today, there are nearly 13.6 million single parents raising over 21 million children. [better source needed] Single fathers are far less common than single mothers, constituting 16% of single-parent families. According to Single Parent Magazine, the number of single fathers has increased by 60% in the last ten years, and is one of the fastest growing family situations in the United States. 60% of single fathers are divorced, by far the most common cause of this family situation. In addition, there is an increasing trend of men having children through surrogate mothers and raising them alone. While fathers are not normally seen as primary caregivers, statistics show that 90% of single-fathers are employed, and 72% have a full-time job. "Father" has been variously defined throughout history as provider, dad, and even sire, carrying connotations of being demanding, disciplinary, and even cruel. Yet, as the writer Armstrong Williams remarks in the article "The Definition of Father," "...every father must take the time to be a dad as well as a friend, disciplinarian, shoulder to cry on, dance partner, coach, audience, adviser, listener, and so much more." Williams, the writer quoted above, goes on to say that he viewed his father as the driving force in his family and also someone who brought strength and compassion to his family. In addition to these qualities, the single father must take on the role of the mother, a role that extends deep into morality, devotion, and the ability to set up an educational yet nurturing environment. Thus it is the father's role to be a source of both resilience and strength, and love and compassion. Little research has been done to suggest the hardships of the "single father as a caretaker" relationship; however, a great deal has been done on the hardships of a single-parent household. Single-parent households tend to find difficulty with the lack of help they receive. More often than not a single parent finds it difficult to find help because there is a lack of support, whether it be a second parent or other family members. This tends to put a strain on not only the parent but also the relationship between the parent and their child. Furthermore, dependency is a hardship that many parents find difficult to overcome. As the single parent becomes closer to their child, the child grows more and more dependent upon that parent. This dependency, while common, may reach far past childhood, damaging the child due to their lack of independence from their parent. "Social isolation of single parents might be a stress factor that they transmit to children. Another explanation may be that the parents do not have the time needed to support and supervise their children. This can have a negative impact on the child." Just as above, it has been found that little 'specific' research to the positives of the father as a single parent has been done; however, there are various proven pros that accompany single parenting. One proven statistic about single fathers states that a single father tends to use more positive parenting techniques than a married father. As far as non-specific pros, a strong bond tends to be formed between parent and child in single-parenting situations, allowing for an increase in maturity and closeness in the household. Gender roles are also less likely to be enforced in a single parent home because the work and chores are more likely to be shared among all individuals rather than specifically a male or female. The newest census that the majority of America’s 73.7 million children under age 18 live in families with two parents (69 percent), according to new statistics released today from the U.S. Census Bureau. This is compared to other types of living arrangements, such as living with grandparents or having a single parent. The second most common family arrangement is children living with a single mother, at 23 percent. These statistics come from the Census Bureau’s annual America’s Families and Living Arrangements table package. Many single parents co-residence with their parents, more commonly single mothers do this. Studies show that in the US it is more likely that a single mother will co-residence with the Grandparents. It is more likely that single parents struggling financially with young children, will live with the Grandparents. Single parent adoption is legal in all 50 states, a relatively recent occurrence as California's State Department of Social Welfare was the first to permit it in the 1960s. Still, the process is arduous, and even next to impossible through some agencies. Adoption agencies have strict rules about what kinds of people they allow, and most are thorough in checking the adopter's background. An estimated 5–10% of all adoptions in the U.S. are by single persons. ^ Gay Brunet. "Orphans". Encyclopedia of Children and Childhood in History and Society. Internet FAQ Archives. ^ Dupaquier J, Helin E, Laslett P, Livi-Bacci M, Marriage and remarriage in populations of the past, London: Academic Press, 1981. ^ a b OECD Family Database, SF1.1:Family size and household composition, OECD -Social Policy Division -Directorate of Employment, Labour and Social Affairs, June 12, 2016. ^ "Table 1337. 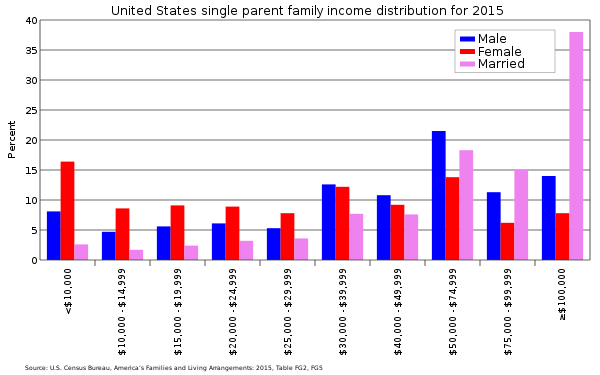 Single-Parent Households: 1980 to 2009" (PDF). www.census.gov. US Census Bureau, Statistical Abstract of the United States: 2012. Archived from the original (PDF) on 18 February 2015. Retrieved 4 November 2014. ^ Bjarnason T, Arnarsson AA. Joint Physical Custody and Communication with Parents: A Cross-National Study of Children in 36 Western Countries, Journal of Comparative Family Studies, 2011, 42:871-890. ^ Statistics Sweden, Barns boende (växelvis boende, hos mamma, hos pappa, etc.) 2012—2017, November 11, 2018. ^ a b Brown, George W.; Moran, Patricia M. (1997-01-01). "Single mothers, poverty and depression". Psychological Medicine. 27 (1): 21–33. doi:10.1017/s0033291796004060. ISSN 1469-8978. PMID 9122302. ^ Afifi, Tracie O.; Cox, Brian J.; Enns, Murray W. (2006-02-09). "Mental health profiles among married, never-married, and separated/divorced mothers in a nationally representative sample". Social Psychiatry and Psychiatric Epidemiology. 41 (2): 122–129. doi:10.1007/s00127-005-0005-3. ISSN 0933-7954. PMID 16467954. ^ Jayakody, Rukmalie; Stauffer, Dawn (2000-01-01). "Mental Health Problems Among Single Mothers: Implications for Work and Welfare Reform". Journal of Social Issues. 56 (4): 617–634. doi:10.1111/0022-4537.00188. ISSN 1540-4560. ^ a b Belle, Deborah (1990-03-01). "Poverty and women's mental health". American Psychologist. 45 (3): 385–389. doi:10.1037/0003-066X.45.3.385. ISSN 1935-990X. ^ Peden, Ann R.; Rayens, Mary Kay; Hall, Lynne A.; Grant, Elizabeth (2004-12-01). "Negative Thinking and the Mental Health of Low-Income Single Mothers". Journal of Nursing Scholarship. 36 (4): 337–344. doi:10.1111/j.1547-5069.2004.04061.x. ISSN 1547-5069. ^ "How Broken Families Rob Children of Their Chances for Future Prosperity". The Heritage Foundation. Retrieved 2017-01-18. ^ Pong SL. Family structure, school context, and eighth-grade math and reading achievement. Journal of Marriage and the Family. 1997 Aug 1:734-46. ^ Pong SL. The school compositional effect of single parenthood on 10th-grade achievement. Sociology of education. 1998 Jan 1:23-42. ^ David Batty (2006-02-21). "Single-parent families double likelihood of child mental illness". the Guardian. ^ "Legacy of the single parent". Mail Online. ^ Anderson, Amy L (2002). "Individual and contextual influences on delinquency: the role of the single-parent family". Journal of Criminal Justice. 30 (6): 575–587. doi:10.1016/S0047-2352(02)00191-5. ^ Thomas, George; Farrell, Michael P.; Barnes, Grace M. (1 January 1996). "The Effects of Single-Mother Families and Nonresident Fathers on Delinquency and Substance Abuse in Black and White Adolescents". Journal of Marriage and Family. 58 (4): 884–894. doi:10.2307/353977. JSTOR 353977. ^ Gove, Walter R.; Crutchfield, Robert D. (1982). "The Family and Juvenile Delinquency*". The Sociological Quarterly. 23 (3): 301–319. doi:10.1111/j.1533-8525.1982.tb01014.x. ^ Snowdon, Stacey (1997). "DIVORCE AND ITS EFFECTS ON CHILDREN". Advocates for Children program, College Park Scholars, University of Maryland. Retrieved 14 November 2011. ^ Thompson, Derek (Oct 1, 2013). "How America's Marriage Crisis Makes Income Inequality So Much Worse" – via The Atlantic. ^ a b "About Single Parent". Single Parenting. April 23, 2011. Retrieved 8 November 2012. ^ Reed, Diane and Edward. "Children of Incarcerated Parents". Social Justice, Fall 1997 v24 n3 p152(18). Retrieved 14 November 2011. ^ a b Eagan, Cristina. "Attachment and Divorce: Family Consequences". Rochester Institute of Technology. Retrieved 14 November 2011. ^ "The American South has the country's highest divorce rates". GlobalPost. 25 August 2011. Retrieved 14 November 2011. ^ Yen, Hope (25 August 2011). "United States Divorce Rate: 2009 Census Report Reveals Startling Marriage Trends". Huffington Post. Retrieved 14 November 2011. ^ "Divorce Statistics". Archived from the original on 13 November 2011. Retrieved 14 November 2011. ^ Baker, A.L. ; Ben-Ami, N. (2011). "Adult Recall of Childhood psychological maltreatment in "Adult Children of divorce": Prevalence and associations with concurrent measures of well being". Journal of Divorce & Remarriage. 52 (4): 203–219. doi:10.1080/10502556.2011.556973. ^ Thomas, D.A. ; Woodside, M. (2011). "Resilience in adult children of divorce: A multiple case study". Marriage & Family Review. 47 (4): 213–234. doi:10.1080/01494929.2011.586300. ^ Cherlin, Andrew (2010). Public and Private Families. New York, NY: McGraw Hill. ISBN 978-0-07-340435-6. ^ Niolon, PhD, Richard. "Children of Divorce and Adjustment". Psych Page. Retrieved 29 November 2011. ^ Hess, Robert D.; Camara, Kathleen A. (1979-10-01). "Post-Divorce Family Relationships as Mediating Factors in the Consequences of Divorce for Children". Journal of Social Issues. 35 (4): 79–96. doi:10.1111/j.1540-4560.1979.tb00814.x. ISSN 1540-4560. ^ Amato, Paul R. (2014). "The Consequences of Divorce for Adults and Children: An Update". Drustvena Istrazivanja. 23: 5–24. doi:10.5559/di.23.1.01. ^ "Single Parent Households – How Does it Affect the Children?". Retrieved 23 April 2014. ^ Eisenberg, Leon; Brown, Sarah Hart (1995). The best intentions: unintended pregnancy and the well-being of children and families. Washington, D.C: National Academy Press. ISBN 978-0-309-05230-6. ^ Waldfogel, Jane; Craigie, Terry-Ann; Brooks-Gunn, Jeanne (2010-01-01). "Fragile Families and Child Wellbeing". The Future of Children / Center for the Future of Children, the David and Lucile Packard Foundation. 20 (2): 87–112. doi:10.1353/foc.2010.0002. ISSN 1054-8289. PMC 3074431. PMID 20964133. ^ McLanahan, Sara; Beck, Audrey N. (2010-01-01). "Parental relationships in fragile families". The Future of Children. 20 (2): 17–37. doi:10.1353/foc.2010.0007. ISSN 1054-8289. PMC 3053572. PMID 20964130. ^ McLanahan, Sara (2009-01-01). "Fragile Families and the Reproduction of Poverty". The Annals of the American Academy of Political and Social Science. 621 (1): 111–131. doi:10.1177/0002716208324862. ISSN 0002-7162. PMC 2831755. PMID 20204078. ^ Lundberg, Shelly; McLanahan, Sara; Rose, Elaina (2007). "Child gender and father involvement in fragile families". Demography. 44 (1): 79–92. doi:10.1353/dem.2007.0007. ISSN 0070-3370. PMID 17461337. ^ "Single Parent Adoptions". The Adoption History Project. University of Oregon. 24 February 2012. Retrieved 23 April 2014. ^ "Intercountry Adoption". U.S. Department of State, Bureau of Consular Affairs. Retrieved 23 April 2014. ^ a b Cake-Hanson-Cormell (2001). "Single Parent Adoptions: Why Not?". Adopting.org. Archived from the original on 6 December 2008. Retrieved 23 April 2014. ^ Shireman, Joan F.; Johnson, Renny R. (1985). "Single Parent Adoptions: A Longitudinal Study". Children and Youth Services Review. 7 (4): 321–334. doi:10.1016/S0190-7409(85)80005-0. ^ a b "Single Parent Adoption". Adoption Services. Retrieved 23 April 2014. ^ "Single Parent Adoption: Challenges of Single Adoption". Adoptions Together. Retrieved 23 April 2014. ^ "One Parent Families". Australian Social Trends, 2007. 4102. 2007-07-08. ^ Statistics, c=AU; o=Commonwealth of Australia; ou=Australian Bureau of. "QuickStats details". www.abs.gov.au. Retrieved 2016-05-17. ^ "Department for Child Protection – Western Australia – Thinking about adoption?". www.dcp.wa.gov.au. Retrieved 2016-05-17. ^ "Parenting Payment – Australian Government Department of Human Services". www.humanservices.gov.au. Retrieved 2016-05-17. ^ "2013 Census QuickStats about families and households". Statistics New Zealand. 4 November 2014. Archived from the original on 13 November 2014. Retrieved 11 December 2014. ^ "Statistics". Gingerbread. 2010. Archived from the original on 24 December 2012. Retrieved 8 November 2012. ^ General Household Survey, 2005 Report, Office for National Statistics, 28 November 2006 – see Table 3.6, Family type, and marital status of lone parents: 1971 to 2005. ^ "Paying the price: The long road to recovery". Archived from the original on 2014-12-17. ^ "FastStats – Births and Natality". 2018-08-08. ^ O'Hare, Bill (July 2001). "The Rise – and Fall? – of Single-Parent Families". Population Today. Retrieved 9 November 2011. ^ "Single Parent Success Foundation". America's Children: Key National Indicators of Well-being. www.childstats.gov. Archived from the original on 16 November 2011. Retrieved 9 November 2011. ^ "More Young Adults are Living in Their Parents' Home, Census Bureau Reports" (Press release). United States Census Bureau. 3 November 2011. Retrieved 23 April 2014. ^ "The Most Important Statistics About Single Parents". The Spruce. Retrieved 2017-12-06. ^ "The Number of Births to Unmarried Mothers in Massachusetts is Higher than You Think". Infinity Law Group. 2016-03-28. Retrieved 2016-03-28. ^ Navarro, Mireya (September 5, 2008). "The Bachelor Life Includes a Family". The New York Times. ^ Bureau, US Census. "The Majority of Children Live With Two Parents, Census Bureau Reports". The United States Census Bureau. Retrieved 2018-12-07. ^ Amato, Paul R., Sarah Patterson, and Brett Beattie. "Single-Parent Households And Children’S Educational Achievement: A State-Level Analysis." Social Science Research 53. (2015): 191–202. SocINDEX with Full Text. Web. 18 March. 2017. ^ "Single-Parent Families – Demographic Trends". Marriage and Family Encyclopedia. Net Industries and its Licensors. Retrieved 1 October 2011. ^ a b "What Do Single Parent Statistics Tell Us?". Single Parent Center. 3 August 2011. Archived from the original on 12 January 2012. Retrieved 7 December 2011. ^ "Population Survey". The United States Census Bureau. The United State Census Bureau. 2014. ^ a b c d "Household Relationship and Living Arrangements of Children Under 18 Years". United States Census Bureau. 2015. ^ Steil, Janice (2001). "Family Forms and Member Well- Being: A Research Agenda for the Decade of Behavior". Psychology of Women Quarterly. 25 (4): 344–363. doi:10.1111/1471-6402.00034. ^ Ruppanner, Leah; Pixley, Joy (2012). "Work to Family and Family to Work Spillover: The Implications of Childcare Policy and Maximum Work Hour Legislation". Journal of Family and Economic Issues. 33 (3): 283–297. doi:10.1007/s10834-012-9303-6 – via proquest. ^ Pierce, Latoya; Herlihy, Barbara (2013). "The Experience of Wellness for Counselor Education Doctoral Students Who are Mothers in the Southeastern Region of the United States". Journal of International Women's Studies. 14 (3): 108–120 – via Proquest. ^ Nomaguchi, Kei; Brown, Susan (2011). "Parental Strains and Rewards Among Mothers: The Role of Education". Journal of Marriage and Family. 73 (3): 621–636. doi:10.1111/j.1741-3737.2011.00835.x. PMC 3489180. PMID 23136449. ^ Pander, Shanta; Zhan, Min (2007). "Postsecondary Education, Marital Status, and Economic Well Being of Women with Children". Social Development Issues. 29 (1): 1–26. ^ Neckerman, Kathryn M. (2004). Social Inequality. New York, NY: Russell Sage Foundation. p. 8. ISBN 978-0-87154-621-0. ^ Rosalind, Duncan, Simon; Edwards; Edwards, Rosalind; University, Simon Duncan University of Bradford; Rosalind Edwards South Bank (2013-11-05). Single Mothers In International Context: Mothers Or Workers?. Routledge. ISBN 9781134227945. ^ "Single-Parent Families – Single Fathers Compared to Single Mothers". Net Industries and its Licensors. Retrieved 18 October 2011. ^ Ludden, Jennifer (19 June 2012). "Single Dads By Choice: More Men Going It Alone". Retrieved 3 June 2014. ^ "father". Website. Dictionary.com. Retrieved 13 November 2011. ^ a b Williams, Armstrong (June 15, 2007). "The Definition of Father". NewsMax.com. Archived from the original on 14 November 2011. Retrieved 13 November 2011. ^ Boehlke, Julie (5 January 2010). "Livestrong.com". Demand Media, Inc. Retrieved 13 November 2011. ^ Williams, Erica (February 6, 2003). "Children in Single Parent Homes and Emotional Problems". The Hilltop. Howard University. Archived from the original on April 3, 2009. Retrieved 14 November 2011. ^ "Better Health Channel". Online Article. State Government of Victoria. Archived from the original on 20 October 2011. Retrieved 2 December 2011. ^ Hyunjoon, Park (2016-04-28). "Living Arrangements of Single Parents and Their Children in South Korea". Marriage and Family Review. 52 (1–2): 89–105. doi:10.1080/01494929.2015.1073653. ^ Ashe, Nancy S. "Singled Out: A Bad Rap for Single Adoptive Parents". Article. Adopting.org. Archived from the original on 8 May 2006. Retrieved 23 April 2014. Bankston, Carl L.; Caldas, Stephen J. (1998). "Family Structure, Schoolmates, and Racial Inequalities in School Achievement". Journal of Marriage and the Family. 60 (3): 715–723. doi:10.2307/353540. JSTOR 353540. "Family Life: Stresses of Single Parenting". American Academy of Pediatricians. Retrieved 8 November 2012. Federal Interagency Forum on Child and Family Statistics (20 July 2005). "America's Children: Family Structure and Children's Well-Being". Backgrounder. Hilton, J.; Desrochers, S.; Devall, E. (2001). "Comparison of Role Demands, Relationships, and Child Functioning is Single-Mother, Single-Father, and Intact Families". Journal of Divorce and Remarriage. 35: 29–56. doi:10.1300/j087v35n01_02. Lavie, Smadar (2014). Wrapped in the Flag of Israel: Mizrahi Single Mothers and Bureaucratic Torture. Oxford and New York: Berghahn Books. ISBN 978-1-78238-222-5 hardback; 978-1-78238-223-2 ebook. Mulkey, L.; Crain, R; Harrington, A.M. (January 1992). "One-Parent Households and Achievement: Economic and Behavioral Explanations of a Small Effect". Sociology of Education. 65 (1): 48–65. doi:10.2307/2112692. JSTOR 2112692. Pong, Suet-ling (1998). "The School Compositional Effect of Single Parenthood on 10th Grade Achievement". Sociology of Education. 71 (1): 23–42. doi:10.2307/2673220. JSTOR 2673220. Quinlan, Robert J. (November 2003). "Father absence, parental care, and female reproductive development". Evolution and Human Behavior. 24 (6): 376–390. doi:10.1016/S1090-5138(03)00039-4. Richards, Leslie N.; Schmiege, Cynthia J. (July 1993). "Family Diversity". Family Relations. 42 (3): 277–285. doi:10.2307/585557. JSTOR 585557. Risman, Barbara J.; Park, Kyung (November 1988). "Just The Two of Us: Parent-Child Relationships in Single-Parent Homes". Journal of Marriage and the Family. 50 (4): 1049–1062. doi:10.2307/352114. JSTOR 352114. Sacks, G. (September 4, 2005). "Boys without fathers is not a logical new idea". Arkansas Democrat-Gazette. Little Rock, Arkansas. Sang-Hun, Choe (October 7, 2009). "Group Resists Korean Stigma for Unwed Mothers". The New York Times. Shattuck, Rachel M.; Kreider, Rose M. (May 2012). "Social and Economic Characteristics of Currently Unmarried Women with a Recent Birth, 2011". U.S. Census Bureau. Retrieved 2 December 2013. Solomon-Fears, Carmen (July 30, 2014). Nonmarital Births: An Overview (PDF). Washington, D.C.: Congressional Research Service. Retrieved 7 August 2014.